I like arriving at a job a few hours early. I can get waffles, check out a few local shops, and snap a few pictures. Maplewood Village is a wandering town, the perfect place to spend a Saturday afternoon. One of favorite cameras to shoot on is a cheap plastic do-it-yourself twin lens reflex camera. Once assembled, the Recesky takes blurry, hipster-esque, low-fi images on 35mm film. The single, tiny plastic lens give images a unique look; the 35mm version of the Holga or Diana. The little $15 kit was the catalyst for me rediscovering film photography, and, therefore, is the reason I ended up in Maplewood. Seeking photography work is but the latest stop on a long road that started when I developed my first Recesky test roll in my bathtub. Shops and restaurants in the village of Maplewood are quaint and inviting. In the morning the streets were filled with shop owners and delivery people. At night the alfresco tables were packed with chatty locals. One great find was the train station. Ever since my internship, where I took a train daily, I have had a fascination with stops and stations. Every platform has its own unique qualities and characteristics. They’re tiny microcosms, representatives of the place in which they occupy. 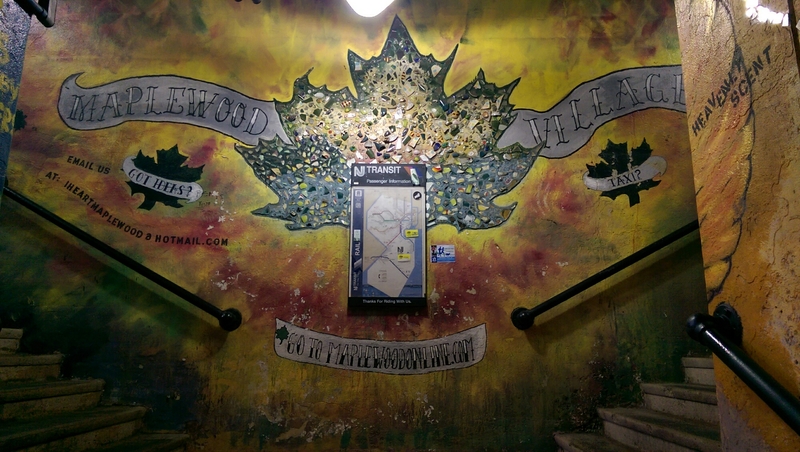 Maplewood’s train station is special in that it has been enhanced by artists. When you venture down into the tunnel beneath the tracks, you see a glimpse of the creativity of village’s residents. Finds like this are a combination of luck, and a desire to wander. I wouldn’t have ever known this place existed otherwise. If I had arrived exactly on time, I would have only said that Maplewood was a boring little village with a few shops and restaurants. However, it’s clear that it is a veritable downtown hub for the suburban homes in the area.